I love stash busting and finding patterns that are easy to do and yet create something useful is a bonus. I found this whilst looking for a new scarf to make from my stash. The pattern is so easy and depending on the yarn you use can be plain or fancy. I added a flower embellishment to mine. I used two different colours and created a stripe alternating the yarn every two rows. 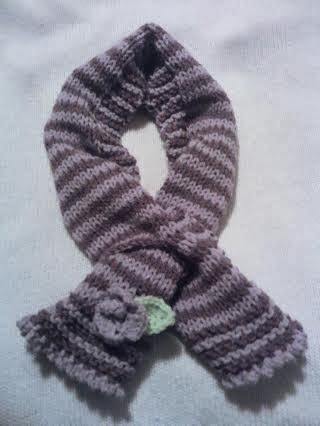 I added a Picot crochet edge to both ends and a crochet flower and leaf. The yarn I used was DK and I used 7mm needles as I wanted the scarf to be soft and lose. My Crochet hook was 4mm using DK yarn. 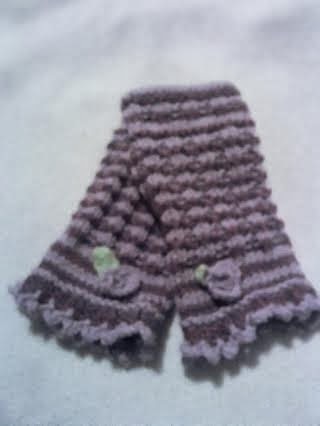 Having completed the scarf I went ahead and made a pair of Fingerless gloves to go with it and made these. These are for my friend who sent all the yarn for the baby blankets for the Neo Natal Unit. I like shorter scarves so I might knit this one. I'm like you when I look for crochet patterns....they have to have the word "easy" in the title!!!!! !